Gravesite archaeology explains the process used to locate evidence of archaeological sites or features on the proposed Westchester Drive route from the perspective of the community. The community was invited to meet with the archaeologist and Wellington City Council roading engineer on the evening of Tuesday, 8th April 2008. The purpose of the evening meeting was to share information. The next day some of the community returned to undertake a site visit. We met on the corner of Glenside Road and Stebbings Road at ten o’clock. Dr Hans Bader took a photograph of us for an historic record of the occasion. Here we are from left to right. 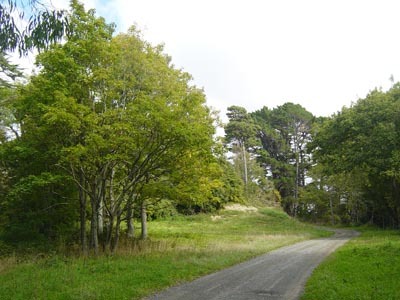 Mary O’Keeffe, an archaeologist appointed by Wellington City Council to record any archaeological sites or features found on the route of the proposed Westchester Drive Link Road. Claire Bibby, President of Glenside Progressive Assn. Inc. She interviewed people about their recollections of the grave over the last eight years. Murray Henderson. His family owned the land where the grave is located from 1886 -1900. Murray grew up in Johnsonville and spent his childhood roaming the hills around Glenside. He saw the grave throughout his childhood. Gwen Silvester. Lived in Glenside most of her life. She regularly visited the grave. Ronnie Pender. Former Glenside resident. His family owned the farm on which the gravesite was located from 1953 to about 1976. He saw the gravesite. Ted Neylon. Glenside resident since the seventies. Retired engineer. Present but not photographed are Dr Hans Bader, archaeologist, Jim Chipp from The Wellingtonian newspaper, Kathryn Hurren, Historic Places Trust and Nicola Molloy, an archaeologist from the Department of Conservation. The morning had been wet and drizzly however the rain cleared by the time we began our walk down to the site. 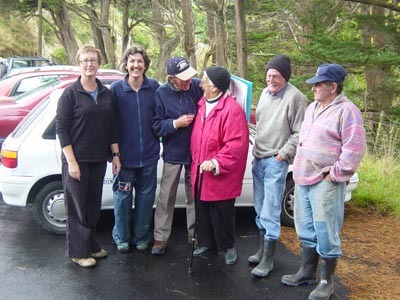 The elders immediately began reminiscing about their memories associated with the Glenugie homestead and life on the farm. The Glenugie block was originally 100 acres and given the title Section 24. Settlers first occupied it in 1840. 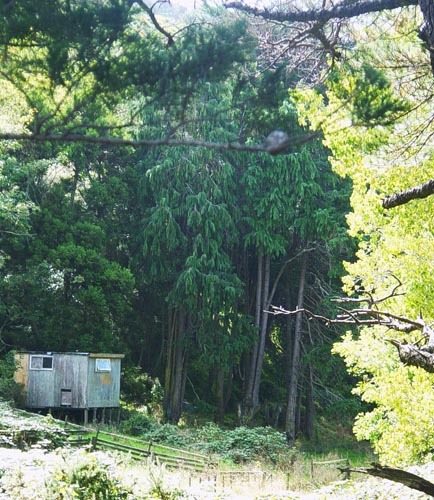 It consists largely of regenerating bush covered hills and a sheltered area of flat land cupped in a dell. Small streams dissect the hills and feed into the lower reaches of the Stebbings Stream. 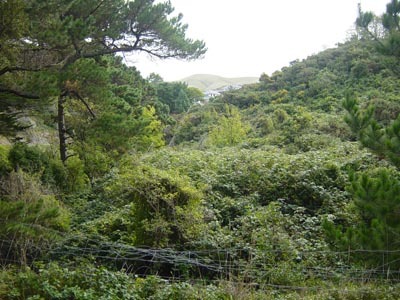 The current owners name the property Waitakaro which means playful waters. There are two areas of flat land on the site. The first is between Glenside Road and the stream. 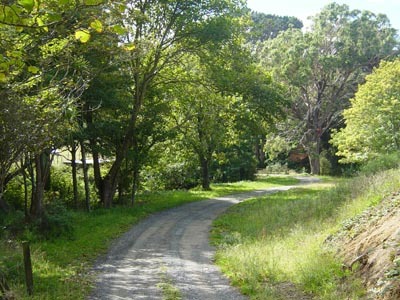 This is the site of the former Glenugie homestead, which was situated here from 1886 until about 1976. 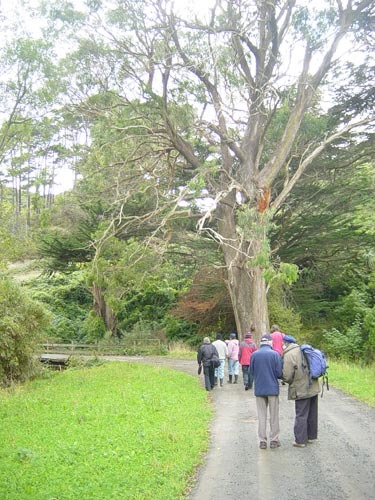 It has garden remnants such as camellia trees, kowhai trees and spring bulbs. 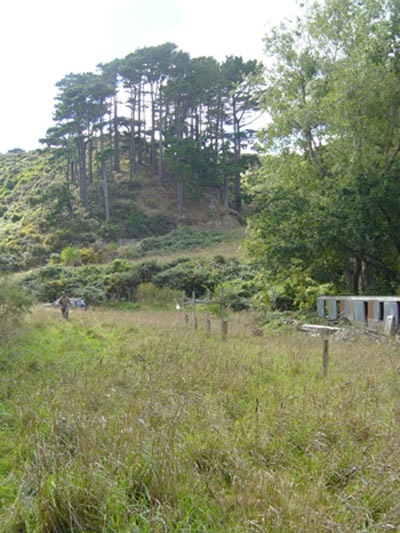 A piggery once occupied the second area of flat land. This flat area is where people recollect the grave being located. Former residents of Glenside can recall sitting on the front steps of Glenugie and looking across the stream to the grave. A wooden bridge provides access across the stream to the second flat area of land. Today it is occupied by several farm buildings and remnants of the Pender’s piggery. The grass is un-grazed and thick underfoot. The banks of the stream are clad with tradescantia fluminensis (wandering Jew). There is heavy sediment on the stream bed, as a result of earthworks upstream for housing in Stebbings Valley. 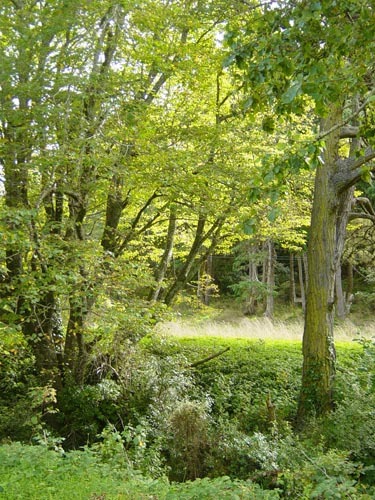 On either side of the stream are tall “English” trees such as elm, and native trees such as hoheria (lacebark). The elm trees were originally planted along the stream by early settlers. One of the ancestors of the Stebbings family was a cart-wright and the elms were planted for their wood, used in the construction of the cart wheels. Ronnie Pender said that when he was a child, he could see the gravesite from Glenugie homestead to the side of an elm tree. The elm tree he shows us is the same one he knew as a boy, when he lived at Glenugie. At the southern end of the flat, beyond the piggery and the stockyards, the grass has reverted to blackberry. To the north west of the stockyards is a plywood shed and a grove of Lawson cypress. Ronnie Pender explained that this grove once extended east and that several rows of trees had since fallen or been felled. Murray Henderson and Gwen Silvester believe the gravesite is beside these trees. 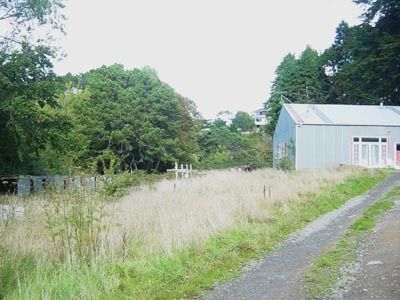 Mr Len Stebbings said that Mr Bill Hodge, an early farmer at Glenugie rediscovered the gravesite when fencing and planted a grove of Lawson trees around it. The Hodge family have a long connection with Glenugie. Bill Hodge married an Oswald, and the Oswald family bought the property in 1913. The Hodge family sold to Pender’s in 1953. Most of the Lawson trees in the grove seem to be a more recent planting. There appears to be only one tree left of the original Hodge planting. It's genus is yet to be identified. 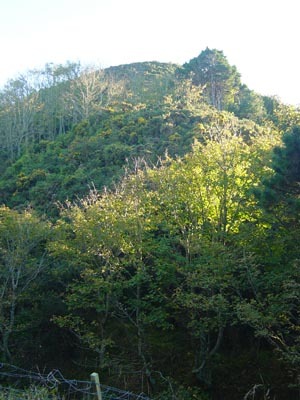 To the south west of the grove of Lawson trees, up on a hillside, is an old maori track and an earth bench cut into the hillside. Some residents who were residing in Glenside before World War II believe that this is a gravesite. One person recalled being told that a family had been buried there. The reminiscing and site familiarisation is over. The work to identify archaeological evidence on site is about to begin.